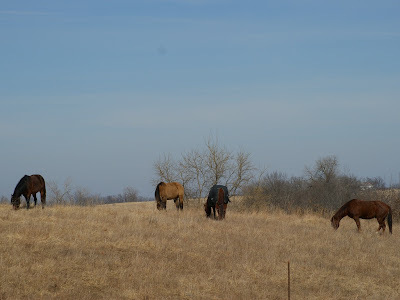 These horses belong to our good friend and neighbor. Out here, when your neighbor needs help, you don't hesitate - you just help. That's exactly what this neighbor has always done for us. coulda, possibly scared said cows into turning around. I'll deny it! I was inside dusting and doing dishes the whole time! So..... anyway, said neighbor was having surgery on his shoulder. So, my Hubs was taking care of the feeding chores for him. 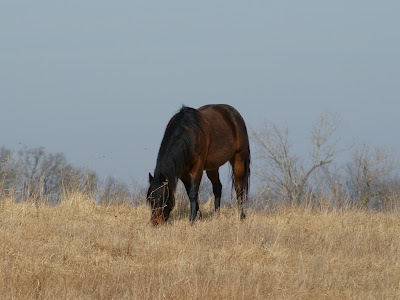 I went to pick Hubs up one day, and decided to take pics of the horses. Hellooooooo Horsee I would like to take your picture. Could you please look at the camera??? OK, fine, I'll take aNOTHER horsee's picture! You'll see - it's your loss! Ummm forget it - I'll just move on. You know what! I did not want your photos anyway! Seriously! I'll go talk to some cows now! At least the COWS will look at me when I talk to them! You just resume grazing. Don't let me bother you. We'll just all pretend like we don't even know each other. LoL...too funny. I luv your monologue that accompanies the pics...maybe the cows just think they're more photogenic?! I love photos of horses. I love horses. 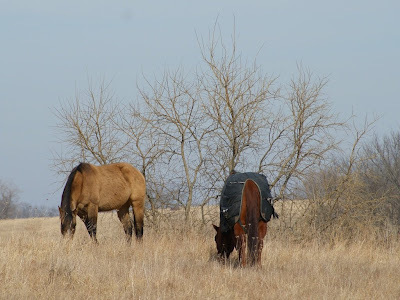 PW's post today is about horse muzzles. Misty, you are so funny. Most of my attempts to photograph horses have ended up exactly the same way! They're still great photos. 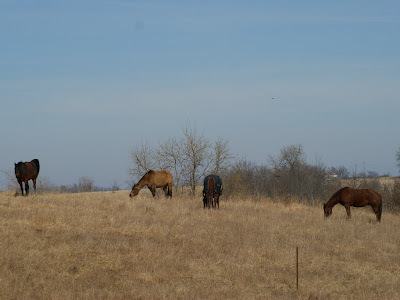 If I want to take a photo of our horses, it's the other way around. They immediately try to get INTO the camera (or try to eat it). That's just too close-up. After a while they begin to lose interest and THEN I have to take my shots, before they go into your neighbour's horses mode. i see you are out walking and roaming again Happy Valentines Day all !!! Cool photos and you are too funny! You are too funny. Thanks for the horses ... I love them. Gorgeous photos as always Misty! Those horses just would not cooperate, would they? Your pictures are still very nice, and I just love the color of the sky in them. Well...of course their heads are going to be down...they are on a hillside! Heeeeeeeelllllooooo!!!! Misty: I do love to take photos of horses but sometimes I wish they would lift their heads for me. 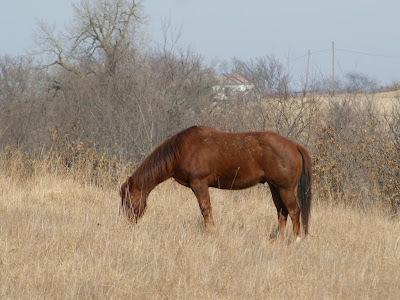 Horses rend not to look at me when I have a camera too, LOL. Lovely and funny post, and we'll all keep your secret. I think we can all relate to uncooperative subjects, especially in the four-legged variety. Loved your photos too mind you, even if they were so busy eating that grass they didn't given you a good head shot. I love the photographs and the way you always weave an interesting, humorous story around them. I just love horses. Very gentle creatures. Always a wonderful tale ypu tell. A very funny post! Love the running commentary that goes with all the images. They look so concentrated on having their fill of grass. Those are great shots even though they didn't feel like lifting their heads. Always a treat of a story to go with your photo essay! The horses are a bit camera shy. Great pictures though! Very serene. The horses in our 'hood are those ridden by police officers.